Say hello to Mansourasaurus shahinae, a 14,000-pound titanosaur that rumbled across the African landscape during the final days of the dinosaurs. Its discovery is answering a long-standing mystery about dinosaur evolution at a time when Earth’s continents began drifting further and further apart. New research published in Nature Ecology and Evolution shows that Cretaceous-era dinosaurs living in Africa and Europe weren’t completely cut off from each other, as is typically assumed. It was at this time in geological history, between 100 million to 66 million years ago, that Earth’s supercontinent Pangaea split apart, drifting into the continents we see today. The fossilized remains of Mansourasaurus shahinae, found in Egypt’s Western Desert, suggests dinosaurs living in Africa and Europe weren’t as isolated as previously thought. The fossilized remains of Mansourasaurus, dated to 80 million years ago, were discovered by Mansoura University Vertebrate Paleontology scientists in the Upper Cretaceous (Campanian) Quseir Formation of the Dakhla Oasis of the Egyptian Western Desert. The researchers, led by Hesham Sallam, say it’s the most complete specimen of a Cretaceous-era dinosaur ever discovered in Africa. Indeed, dino fossils are hard to come by on this continent. The ancient African habitat consisted of lush vegetation, rather than the exposed rock of dinosaur “treasure troves” found in the Rocky Mountains, Gobi Desert, or Patagonia. Remarkably, the paleontologists were able to uncover the animal’s skull, lower jaw, some vertebrae, ribs, bits of the shoulder and forelimb, and a section of its hind foot. They even found traces of dermal plates—tough, bony plates embedded in its skin for protection. Mansourasaurus was a titanosaur, a subgroup of sauropods. 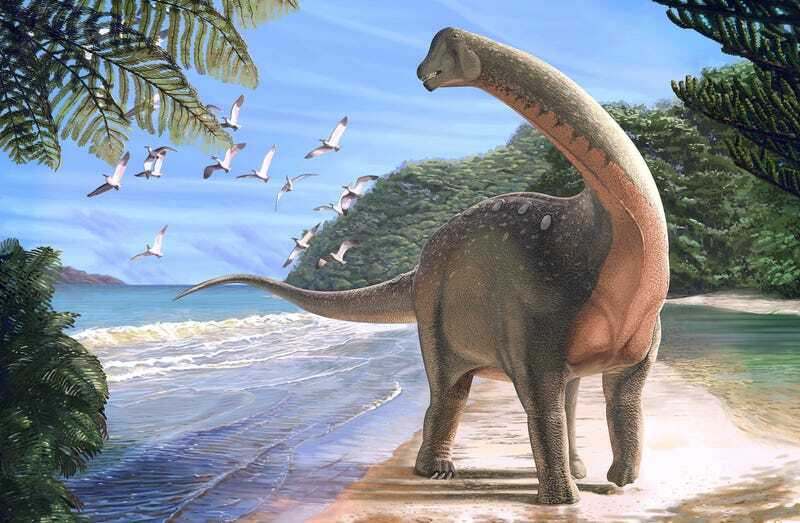 These giant, four-legged, long-necked herbivores were very common during the Cretaceous, and among the largest terrestrial animals to have ever stomped on Earth. Examples include Argentinosaurus, Dreadnoughtus, and the mind-bogglingly massive Patagotitan mayorum, which weighed roughly 152,000 pounds. But Mansourasaurus was a moderately sized Titanosaur, weighing the same as a modern African elephant and measuring the length of a school bus. Eric Gorscak, a postdoctoral research scientist at The Field Museum and a contributing author on the study, said he was shocked by the relative completeness of the skeleton. African sauropods have been discovered before, but Mansourasaurus is special on account of its completeness. It allowed Sallam’s team to perform a detailed physical analysis of the animal, and then conduct comparative analyses to determine how related it was to sauropods living in northern Africa and southern Europe during at this time. During the earlier dinosaur eras—the Triassic and Jurassic—our planet featured a giant landmass called Pangaea. This supercontinent began to drift into separate continents during the Cretaceous. Needless to say, this had a profound effect on the dinos, who were suddenly split apart into separate populations, each charting a new evolutionary course. Owing to the poor fossil record, paleontologists weren’t sure how separated African dinosaurs were to their neighbors. Mansourasaurus is now considered a “key new dinosaur species” as it’s filling in the gaps in Africa’s dino history. The researchers concluded that Mansourasaurus is more closely related to dinosaurs from Europe and Asia than those found farther south in Africa or in South America. It’s the first “unambiguous” evidence that some dinos could still move between Africa and Europe during this period in history. Africa’s dinosaurs weren’t completely cut off and isolated, moving across pathways that existed between the two continents.